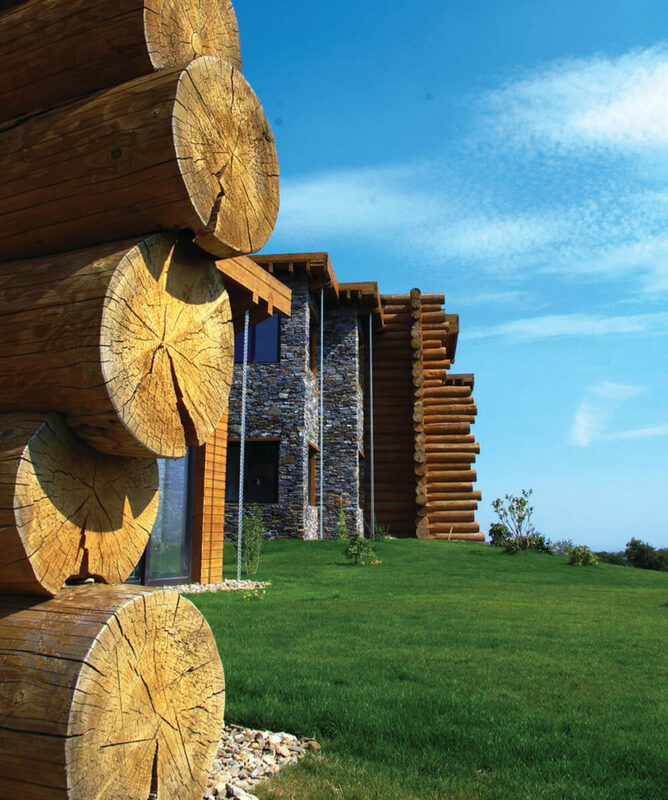 Welcome to our gallery focusing on the Sustainable Carpathian Lodge by Tecto Architectura. 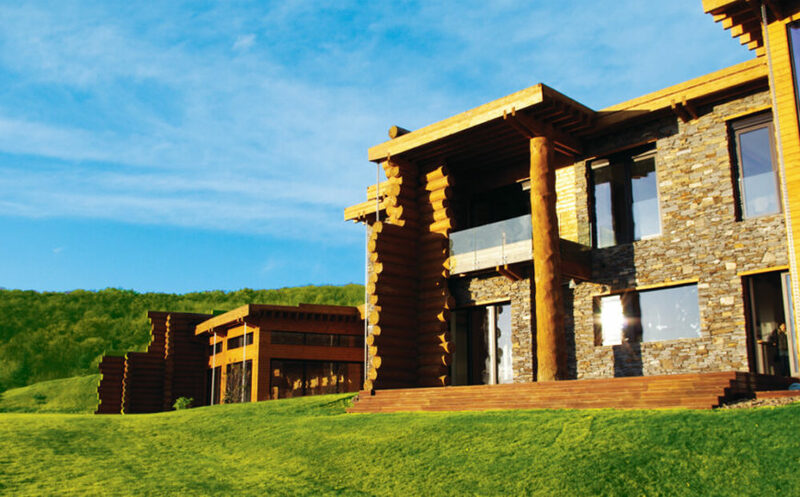 This uniquely styled home was built in Buzau County, Romania, and came to completion in 2012. The overall design of the home uses light and shadows and its own geometry to create a nuanced, spacious appearance and sustainable footprint. 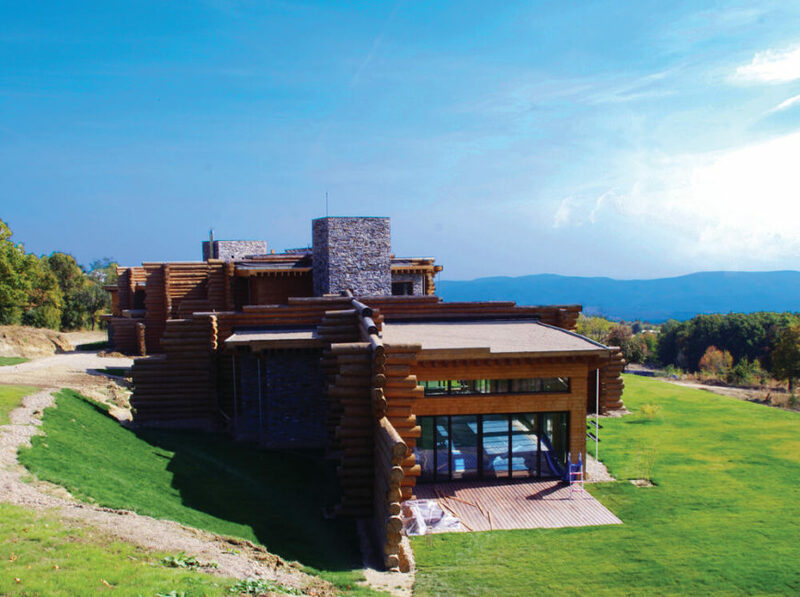 The exterior is covered in rustic elements, with large natural wood log beams and stone defining the facade from top to bottom. The rich wood tones give it a timeless appearance despite its thoroughly modern construction. The interior is flush with refurbished furniture, meant to conjure the memory of old fashioned elegant homes and also act as another sustainable facet of the design. The furniture continuity helps convey a connected relationship across the various layers of the home. A major principle of the design is that form follows energy. The entire building has been oriented to maximize use of natural light, while creating a minimal impact on the natural environment. The structure follows the curves of the terrain, leaving as much of the landscape undisturbed as possible. 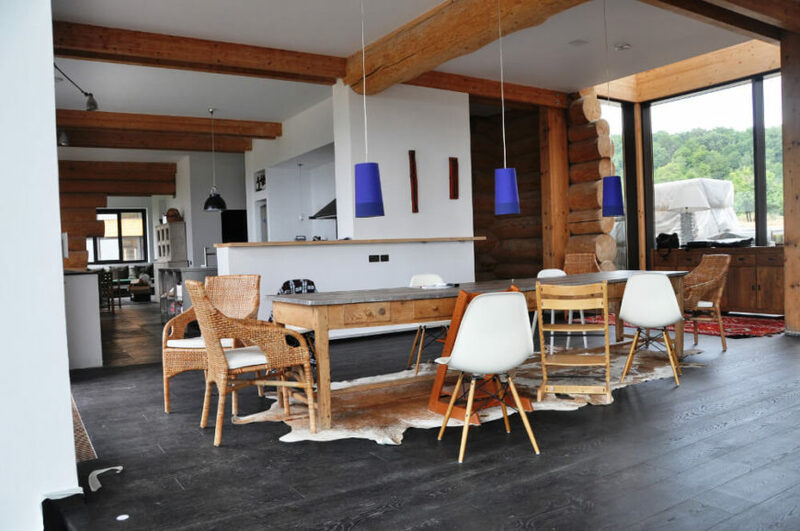 The home is comprised of natural, unprocessed, raw materials that have a very long life and recyclability, resulting in a low carbon footprint. The design balances lightness and heaviness with contrasting materials, like broad swaths of glazing, laminated timber, and stone towers. 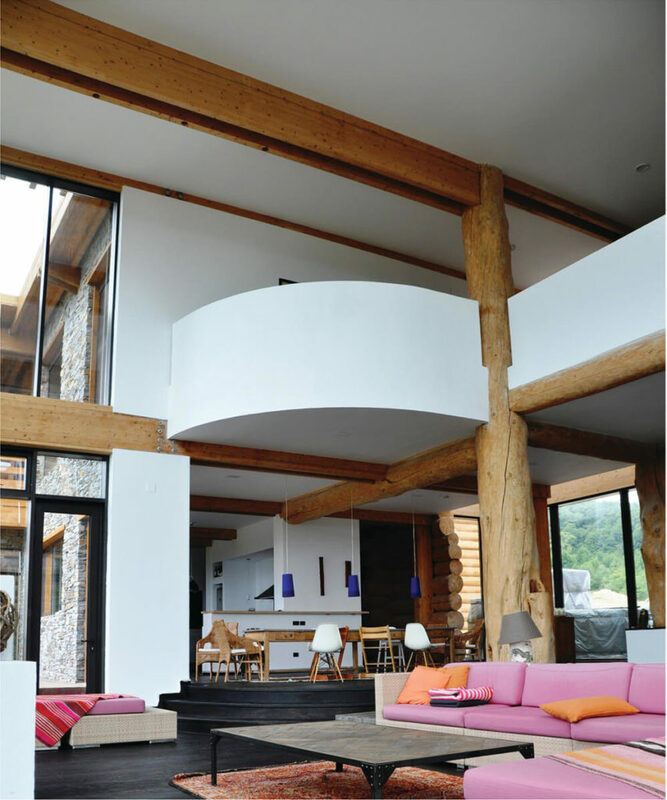 The timber itself is composed of spruce logs from local forests, making for massive, strong structural elements. 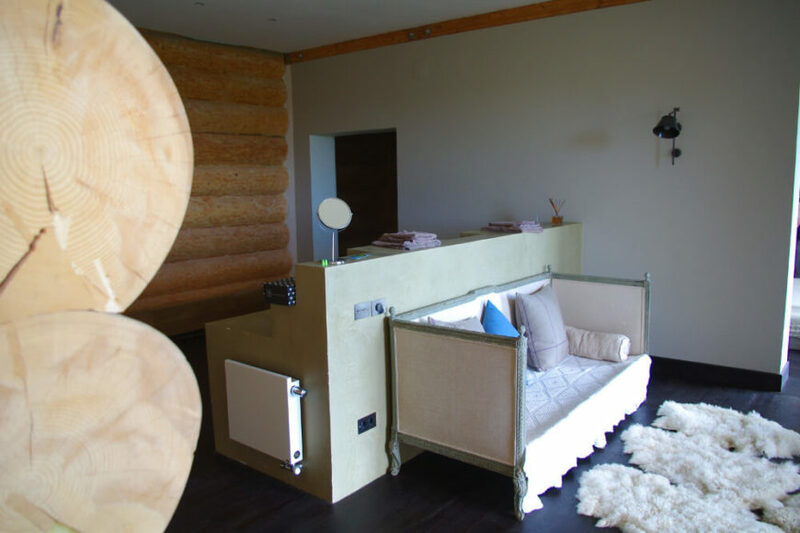 The home has been insulated with loose cellulose and pressed wood fiberboard, an all natural solution with great insulation properties. To combat variations in humidity, the walls are built with vapor-proof membranes to resist condensation in winter and allow for drying in summer. These membranes are also wind and rain-proof. 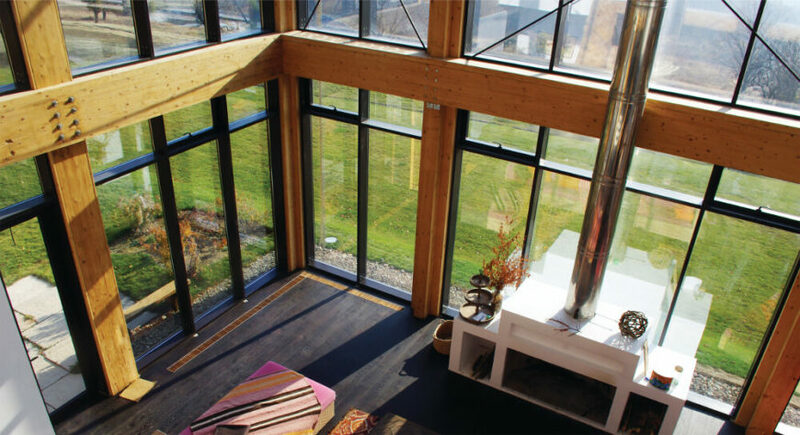 The home boasts an array of renewable energy sources, beginning with 3 central mechanical ventilation with heat recovery (MVHR) units providing supply and exhaust ear that recovers 85% of all heat. An earth-to-air heat exchanger (EAHX) provides a free constant temperature year-round, with passive cooling in the summer and preheating during winter. Beyond this, the house features active water cooling, a compact heat pump, and a thermal solar power plant covering 20 panels and 3 buffer tanks for the generation of hot water and supplemental heating. The tanks store the heat on various levels of the home, as opposed to a traditional boiler. 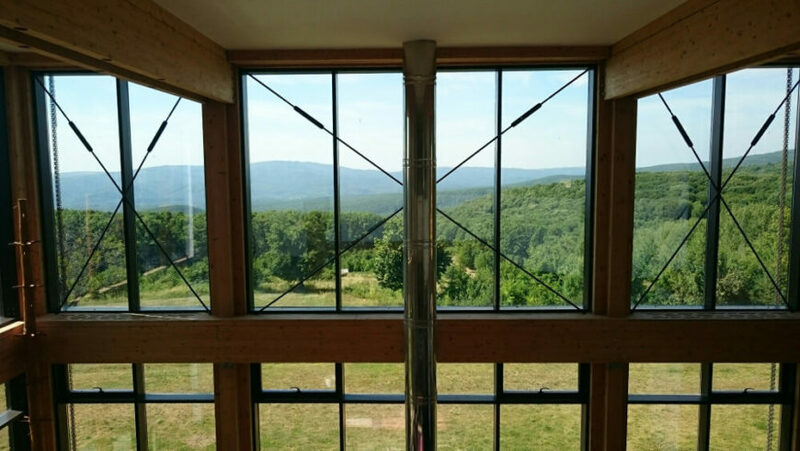 With radiant floor and wall heating, plus in-floor mini convectors and low-h20 radiators, the home has one of the most efficient, holistic heating and cooling systems we’ve ever seen. There’s even a pair of biomass stoves for completely natural heat power. 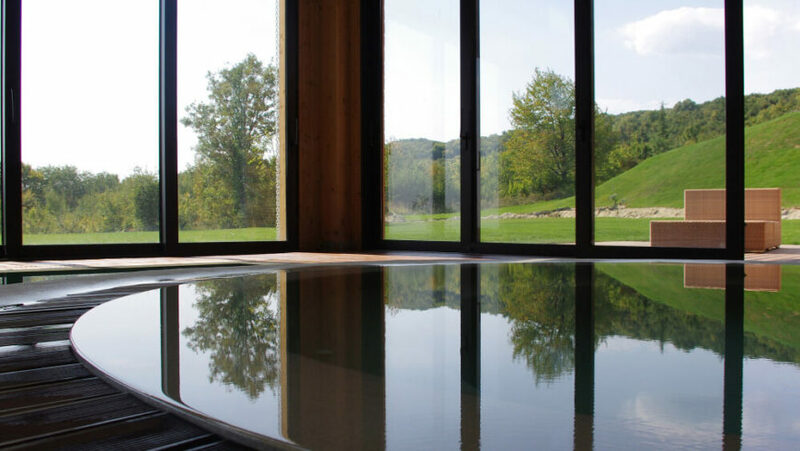 When it comes to water management, the home features a dehumidification process to dry out the air in the pool wing, plus a passive rainwater harvesting system that is used to irrigate the surrounding vegetation by way of a pair of manmade reservoir lakes. As a final testament to the home design’s sustainability, there’s a wastewater treatment plant consisting of a 3-room underground tank and filter system that provides clean water for toilets, landscape use, and gardening. 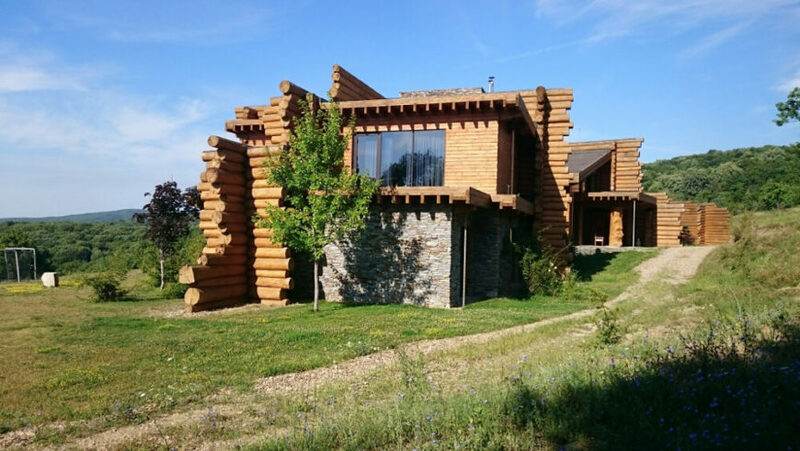 Here we see the home on approach, with the series of natural logs making for an idiosyncratic, organic shape looping from the landscape. Large expanses of glass are strategically placed to maximize sunlight usage. The house sits nestled within the untouched landscape, set into a slope and oriented to best utilize natural light and passive heating. The stone towers connect the three distinct wings of the home. Approached on the rear side, we see a massive natural wood deck, complementing and contrasting with the rich timber and stone construction. Massive windows facilitate and openness of design. Moving inside, we arrive at the central open space of the home, the main intersection between the living room, dining area, kitchen, and passages to the private bedroom areas. 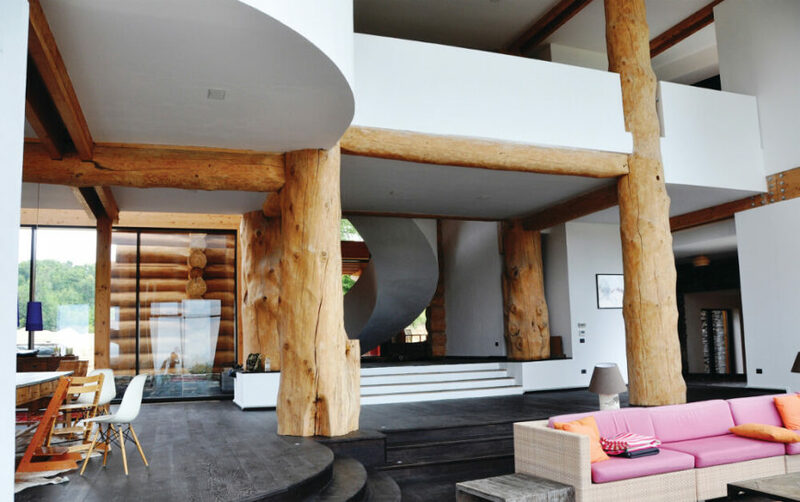 Massive log columns stand supporting the structure at center. The second floor catwalk overlooks this sprawling open space, flush with the contrast between natural wood, white walls, and black stained flooring. Exposed beams criss-cross the design for a hybrid rustic-modern look. The dining room centers on a lengthy rustic style table, surrounded by an assortment of traditional and contemporary chairs in varying styles. The galley style kitchen extends to the left. 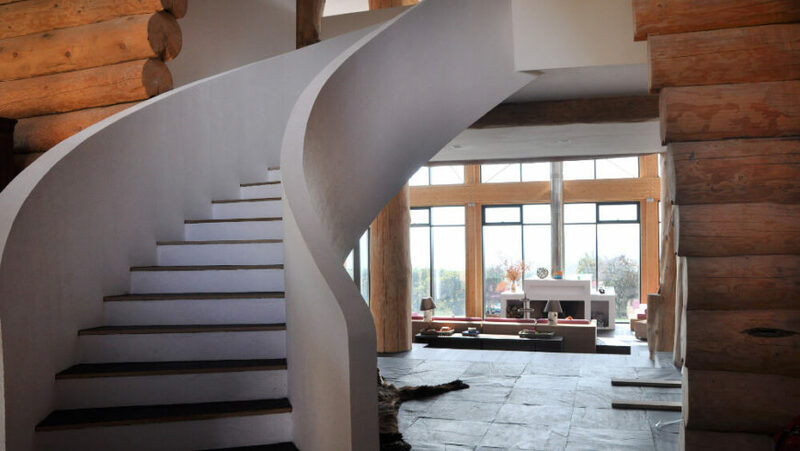 A curved staircase floats out over the open space in white, defining the look of the upper floor as distinct from the earthy first floor. Beyond, we see the living room sprawling beneath a set of massive windows. The living room centers on a unique modern fireplace, a free standing unit in white with shelving built-in and a singular metal pipe extending to the roof. This touch perfectly exemplifies the timeless design of the home. 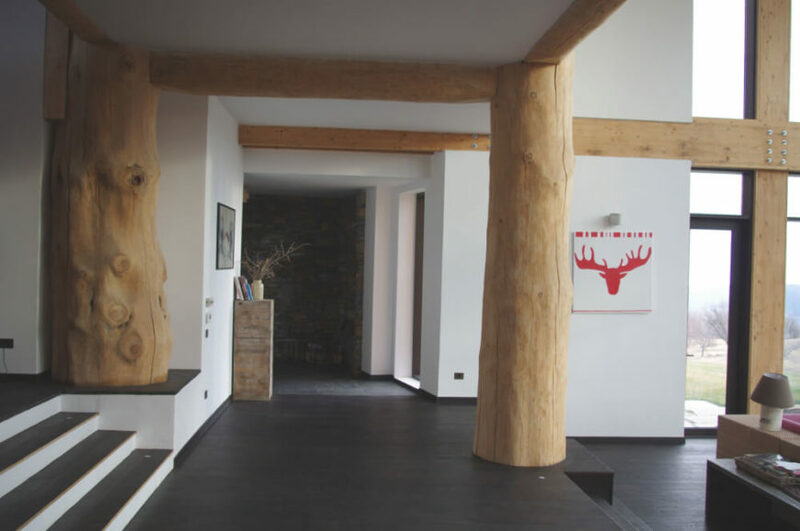 To the side, we can see the magnificent natural wood pillars supplementing the exposed wood beams, cementing the “cabin-like” look of the home and adding a stark contrast to the modern style. Here’s a view of the living room from above, highlighting the open feel granted by wraparound, double height windows that surround the space. The fireplace adds a focal point and stark contrast to the room. 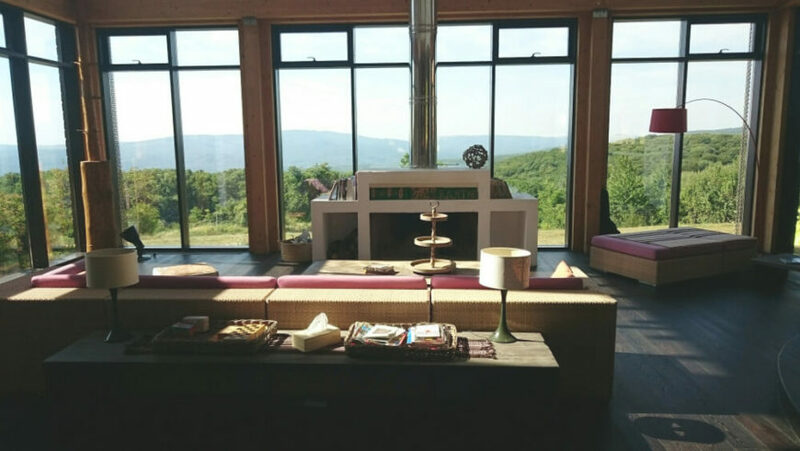 Viewing straight across the two-story space of the living room, we can see across the vast panoramic landscape through the massive windows, with the fireplace pipe at center. As part of a bedroom en suite, we see an ornate refurbished sofa backed against a bathroom island, lit naturally through the large glass panels on this side of the home. The log cabin look extends to parts of the interior, as seen here. This bedroom is decked out in stark minimalism, with a black accent wall set against a spare layout with only a low white bed, pale armchair, and pair of rustic bedside tables filling the space. Here’s one of the bathrooms, another exercise in elegant restraint. 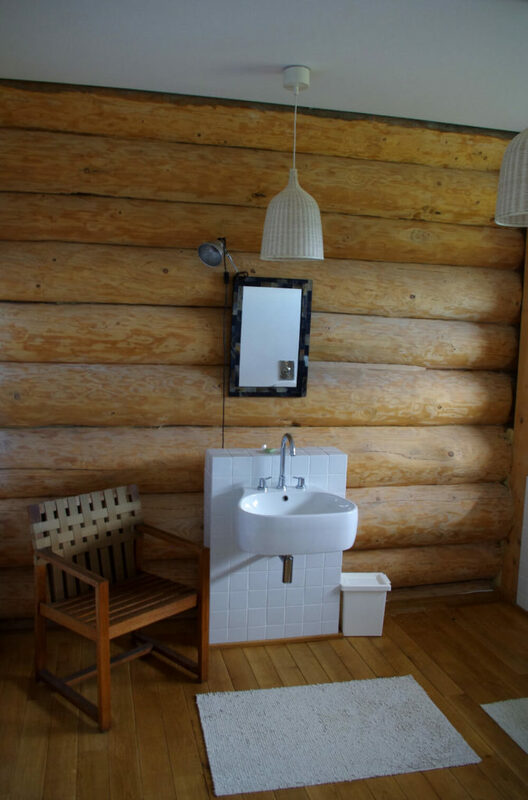 The floating sink is mounted to a small slab of white tile against the log wall, with only a small mirror and pair of pendant lights above, and a wood chair to the side. 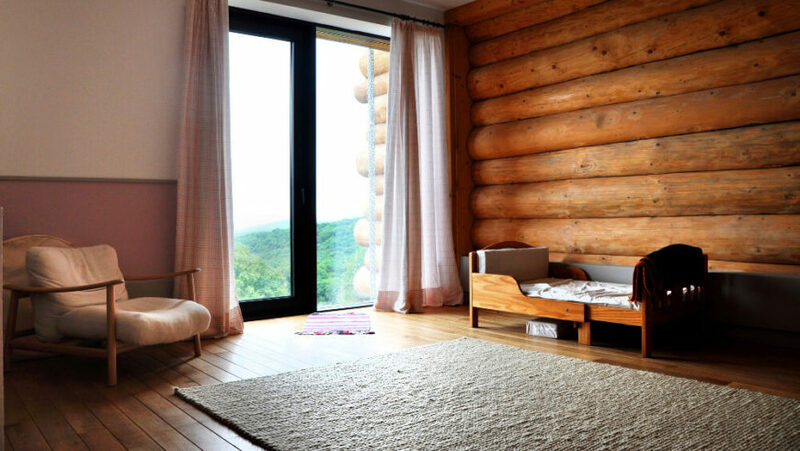 This cozy room is set up as a nursery for a small child, with a natural wood bed and large loosely cushioned armchair the only visible furniture. The sliding glass door here provides direct outdoor access. The pool room is an expansive, open interior space completely wrapped in full height windows for an open, airy look. The dehumidification elements work here to keep the home free of any possible moisture damage. With a low view across the pool, we can see the landscape unfurling through the full height glass. 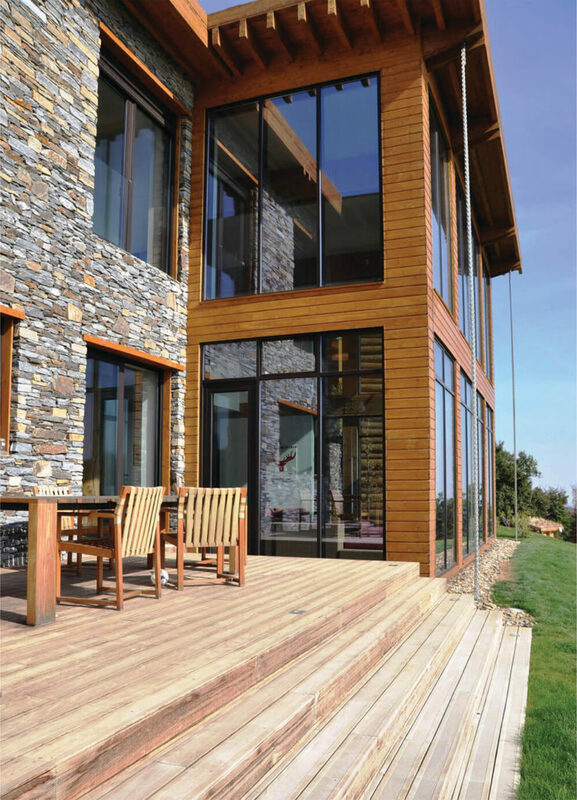 The windows create a seamless visual transition to the outdoors, helping cement the home in its environment. The home is a sprawling but tightly and cohesively connected structure, awash in modern style and rustic elements.